The Temple of Sinawava is the park's hallmark, with its paved trail following the Virgin River upstream through ever-narrowing canyons of sandstone to the Zion Narrows, framed by hanging gardens of flowers and waterfalls. Hike the mile up a paved path to pass hanging gardens and cascading pools of the Virgin River. 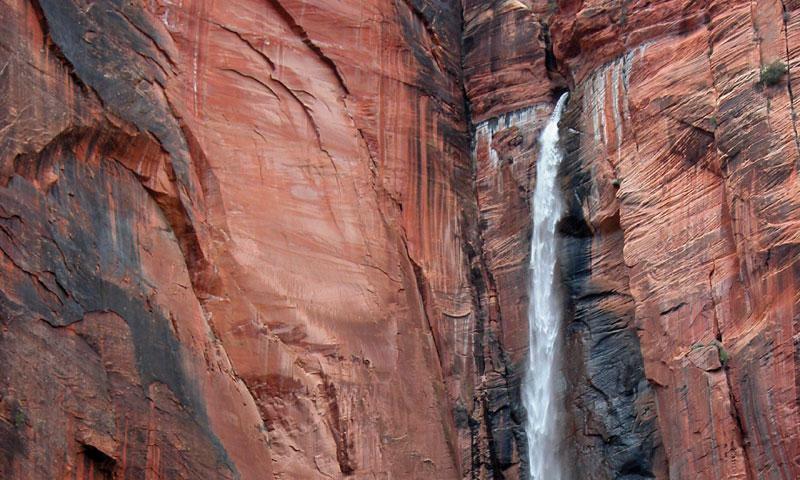 Continue past the pavement's end to explore the Zion Narrows. The walls of the amphitheater reach heights of over 3,000 feet from the canyon floor. Dip your feet in the river to cool off in the summer heat! The Temple of Sinawava is the massive amphitheater that unofficially marks the beginning of the canyon, though a stroll on the Riverside Walk will show that the canyon starts much farther upstream. It quickly becomes apparent why the temple has become one of the park's most popular destinations. The trail alone is lined with wildflowers during the spring and summer. As the temple comes into view, sheer rusty red and chocolate brown cliffs rise high into the sky, seemingly never-ending like some of the world's tallest skyscrapers. Picturesque waterfalls tumble gently into a deep pool below and extensive hanging gardens of lush green foliage and brightly colored flowers hang from varied levels and crevices, making it seem almost too good to be true. It is definitely postcard material. To arrive at the Temple at Sinawava, Zion provides shuttles to reduce traffic congestion. The temple is the last shuttle stop along the Zion Canyon Scenic Drive. Shuttles are equipped with bike racks and may be boarded anywhere along their route. The most popular boarding location is the parking plaza of the South Entrance. For more information, contact the Zion National Park directly. Just one mile in length and paved over the entire route, the Riverside Walk is the park's most popular hike, ending at the Zion Narrows. Fully accessible to those with special needs, the walk is as easy as a sidewalk stroll, making it perfect for everyone. It is possible to continue on through the Zion Narrows, walking directly up the riverbed. Many people try to make it to Orderville Canyon, a two-hour hike upstream, where the canyon is at its narrowest and most breathtaking. Swimming may be difficult during low water, but people often cool themselves in the river by dipping in their feet or splashing their face. Erosion, land slides and other forces of nature continue to have their effect on the canyon. In 1995, over 100,000 cubic yards of earth and rock dammed the Virgin River in a 500-foot landslide. About 430 people were blocked in until an alternate road could be carved.